Tim Brieaddy and I have finished another awful video replay. This time we take our massive production team all the way to the Pacific for a taste of the PTO. 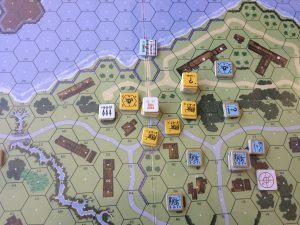 This scenario has the Japanese trying to take a hill against a totally HIP USMC OOB that includes 2 HMG’s, 2 MMG’s, and a 9-2 leader. In case Tim and I didn’t forever sour you from the PTO by watching this horrible video, Rising Sun can be purchased almost 25% off by using coupon code ‘Turkey’ ’till Monday. Click this link for some interesting reading on the battle for Bougainville in the Solomon Islands. In case you missed post #51, we are reminding you that everything (exc. pre-orders and pocket rulebook) are an additional 10% off until midnight on the 28th. As always, shipping is free. 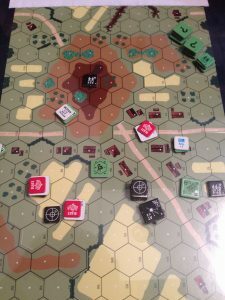 I am hoping to start a series of video scenario replays that can be watched in an hour. The scenarios will have to be short and I will have to edit out the down time (Tim getting up to raid the liquor cabinet). Tim and I have discussed playing some Speed ASL again, and even Drunk ASL (one drink per turn). I just purchased a new Gopro so hopefully some of the issues with recording and sound quality will be addressed in the new series. The Map Cases that were just put on pre-order are about 50% complete. Hopefully they will be ready by Christmas. Sniper ELR cards are in limbo because of a lack of photos of snipers from various nationalities including the USMC, Chinese, French, Minors, and Japanese. 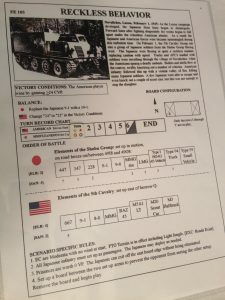 There is the option to release the cards in two sets, with the first set including only the German, SS, Soviet, US Army, and Great Britain. I would be willing to give store credit to anyone who could provide 6 sniper photos from the missing nationalities. MMP isn’t having a Black Friday Sale?!? No problem because we are. 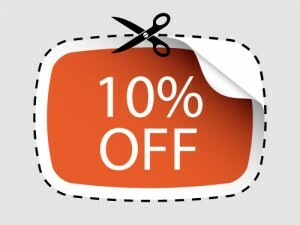 Use coupon code ‘Turkey’ to get an additional 10% off of your entire order (exc. Pocket Rulebook and Pre-orders). This is in addition to our already discounted prices (usually 10-20%) off retail and as always, shipping is free (ConUS only). 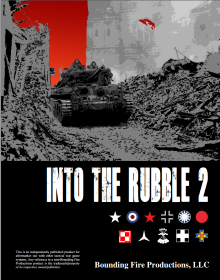 Into The Rubble 2 from Bounding Fire Productions is now on Pre-order for the ultra low price of $68.00* shipping included. Click on the image above for more information. *The original price I posted was $65.00 but I was reminded by BFP that this was against BFP policy and cannot reduce the price lower than theirs. In accordance, I have raised the price to match their $68 pre-order price. My apologies for any confusion or trouble that this may have caused. We will be giving away a free t-shirt with any order over $150. The t-shirts are courtesy of Tim Brieaddy at Redheaded T-shirts where you can choose from a large selection of ASL and WWII themed shirts. Each shirt will be in limited quantities and a collector’s item, soon to be worth more than the Virgin Mary toast on e-bay. This month’s shirt features a German sniper in dot camo with a Gewehr 43, with his spotter in the background on a black shirt. This year I had the great privilege of riding up to Cleveland with my best friend Tim Brieaddy. It was Tim’s first time to ASLOK and he was so excited to be away from all of the rigors of everyday life, meet some friends whom he had made through his t-shirt business. 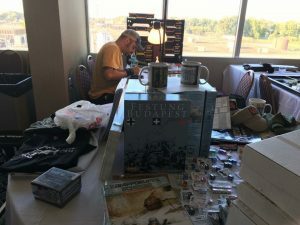 Derek (that’s me) setting up in the background with some of the Ritterkrieg store open for business. We arrived Friday night where one of the first games in the USA vs. World was taking place between Wild Bill and George Tourmiere. John Dober being photo bombed by Tim Brieaddy. I started off Saturday with an all day marathon with my good friend John Dober. We managed to get in four games, all from Fanatic Enterprise. They were all quick firefights. Oddly enough this is a battle on a mountain top with no water in sight. 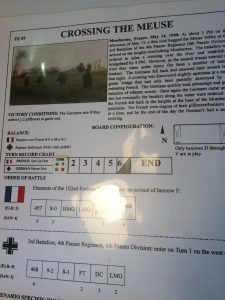 I played the Germans and and routed the French from the mountains with the help of some flame throwers and satchel charges. The Germans (hiding beneath the trenches on the mountain top with some recently rallied stragglers following close behind. New Victims which pitted the Finns against the Ruskies. 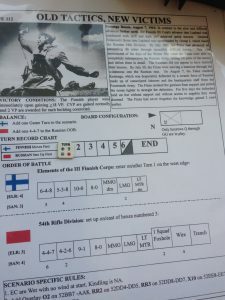 Being such a short scenario and having 4-2-6 conscripts, I wanted to fight it out at point blank range in the woods where those 4’s become an 8. If I can just slow him down for a turn or two, his Finnish supermen will run out of time and be unable to take the village. 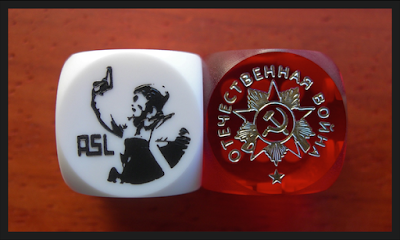 Russian set-up. Note that all fortifications set up HIP until in LOS of the Finns. After the final Finnish push, there isn’t enough left to grab the victory locations. Definitely my least favorite scenario of the gang. 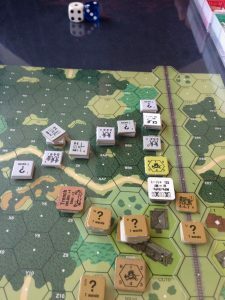 My Japanese convoy sets up in convoy in plain view of a ton of US nastiness that gets to prep fire on turn 1 before I can even move out of the way. 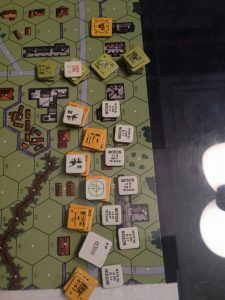 All I could do was wait for my turn to duck into alleys with what survived and unload and hunker down in stone buildings while the Yanks close in for the kill. I managed to hold off the Americans long enough but the whole thing was just too choreographed for my liking. 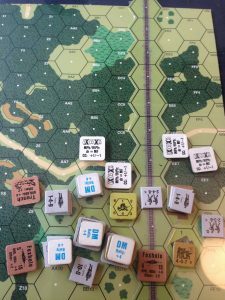 FE125 Lessons learned the hard way, where the SS (that’s me) defended against a slew of Bulgarian tanks. Initial German set-up. Note that all units set up HIP. 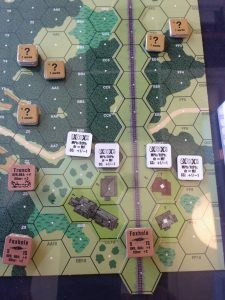 With the help of some timely ROF, the Germans manage to brew up the ‘borrowed’ enemy tanks. It looks like I drove all the way to Cleveland to play my next door neighbor Tim Brieaddy. I was the German player in this one. Initial set-up and British entry areas. 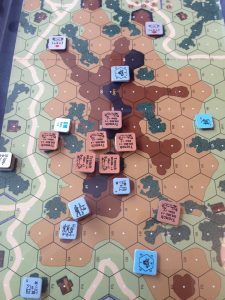 This one swung back and forth several times and included snake eyes against my 9-1, 4-6-8, and mmg by his flamethrowing Badger followed by boxcars on the flame to kill table against my Jagdpanther thus recalling his most feared weapon. ASLOK giveth and ASLOK taketh away! I had heard about this odd little fight and had been meaning to play it since I bought Journal 11. 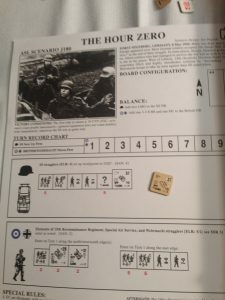 This scenario features the Wehrmacht and British teaming up against some die hard SS that just won’t accept that the war is over. 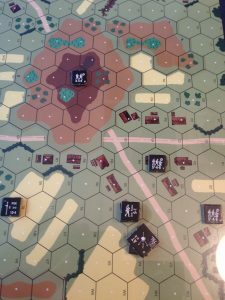 The SS are held up in the forest and have few men but lots of fire power. John chose to skulk his SS away instead of fighting it out with the attackers. I managed to catch up to him around turn 4 and close in from all sides. 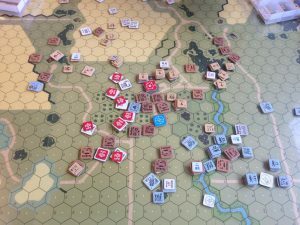 John admitted later that he probably should have just exchanged punches with me early on while he had the advantage of concealment, morale, a rout path, and firepower. Turn 2, the SS are pulling back to the hill. Note the strange alliance of Germans and British. I always enjoy playing Brian as much for his stories of ASL past as for his great sportsmanship and kind friendship. Now, If there is one thing I love in life, it’s Panthers. If there is one thing that I hate in life, it’s Firefly’s. I feel so inadequate in my masculinity having 18 factor of frontal armor hiding out of sight. Truth be told, you have a good chance of surviving a hull hit, but it never seems to work out that way for me. 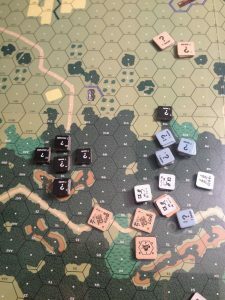 Somehow in this one, I managed to pull off the win while only losing one Panther. 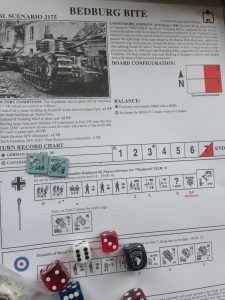 Brian rolled one greater than the kill number on at least three occasions and one by one his Shermans brewed up leaving a permanent smokescreen for my advancing grenadiers. Without tank support, it turned into a one sided affair. I was really excited to get a chance to play Steve Pleva in a mini semi final game. Steve is ranked #1 on the ASL Area ranking and handed me my lunch the only other time I played him a few years ago at ASLOK. This was my title fight and I although I had him on the ropes early, his skill is something that is hard to explain and harder to overcome. As the match wore on, it became clear why he is ranked #1 in the world, cutting off every possible route to a comeback. I look forward to playing Steve again soon. Steve, setting the machine in motion. 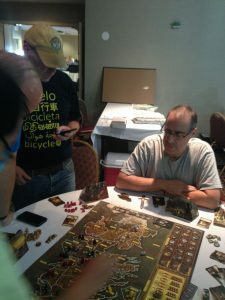 Friday night I managed to convince some friends to play Game of Thrones. Unfortunately, I got really sick with a headache so I missed most of the game. 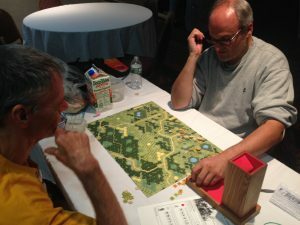 It drew a lot of attention from the ASL’ers, some of whom have played it before and really enjoy it. 20 games in 8 days, including 2 four game days and I was…ready for more ASL! I ended up with a 15 and 5 record. At one point I was 11 and 1, but then the heavy hitters put me in my place. Regretfully, I didn’t get a chance to play Andy Beaton, whom I always look forward to matching up against. 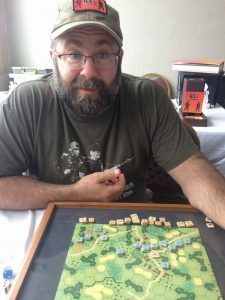 I did get to play Dan Stanhagen twice which is always on my ASLOK to do list. I look forward to next year and seeing all of my friends again. 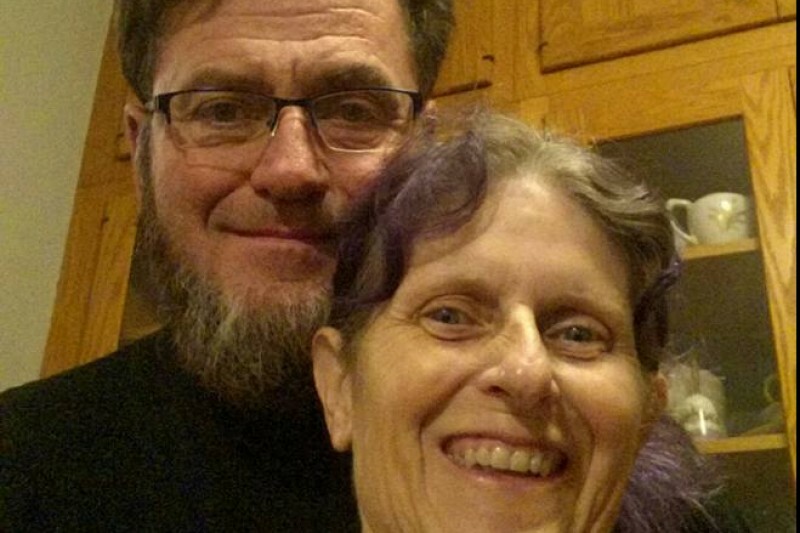 Dean and Sara Essig’s fight against pancreatic cancer. 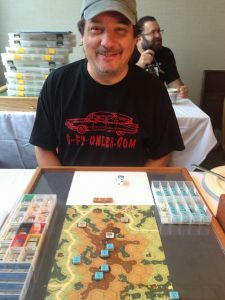 Although I try to keep this page dedicated solely to ASL, I am making a worthy exception to make you aware and encourage you to give back to the Essig family for all they have given for our hobby. Both in some of the best games made but also opening their home in past years to host Homercon. Dean, the creator of the OCS, TCS, SCS, and countless other great systems and games is raising money to support Sara’s fight with pancreatic cancer. Please click on the photo above and you will be redirected to their Go Fund Me page. 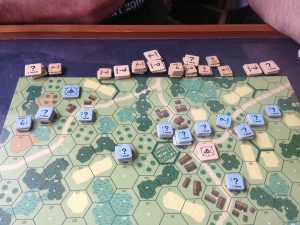 New post from Hong Kong Wargamer. In this blog, Jackson visits the War Museum in Bovington, UK. Panthers, and Tigers, and Lees, Oh my! We have received many sold out items and even some that were believed to be out of print. 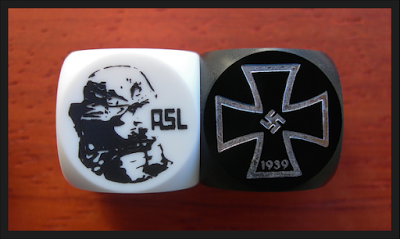 We received very limited quantities of LFT’s Rat Chart, LFT’s KG Sherer, ASL 30th Anniversary German and Russian Battledice. 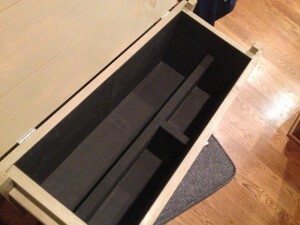 I know you have heard this before but… I am resuming my woodworking products. 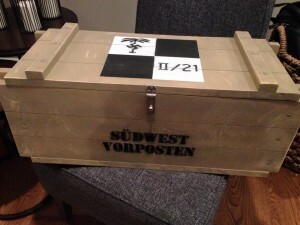 I have already started a small batch (4 units) of Ammo Box/Map Cases. If interested in one, let me know ASAP as I won’t be making any more until I have made some tables and towers, so it could be a year before they become available again. You can contact me at dritter3@triad.r.com. 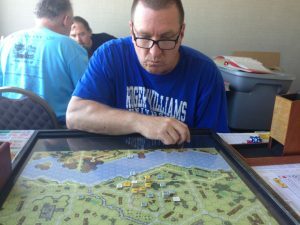 The third annual ‘Where the Iron Crosses Grow’ team Tournament is less than 5 months away. I will release the date in the next post.